How do you make BBQ Style Baked Tofu? Hetre is where we begin. We often press tofu, cut it into small strips and freeze it over night. This gives the tofu a firm textures that closely resembles that of meat (for those who may have a little aversion to tofu's usual "spongy" texture). After removing it from the freezer about an hour before you plan to use it, you can place it in a skillet with your favorite BBQ sauce, cook to heat through and serve it on sandwich thins or whole wheat buns for a delicious BBQ sandwich treat! 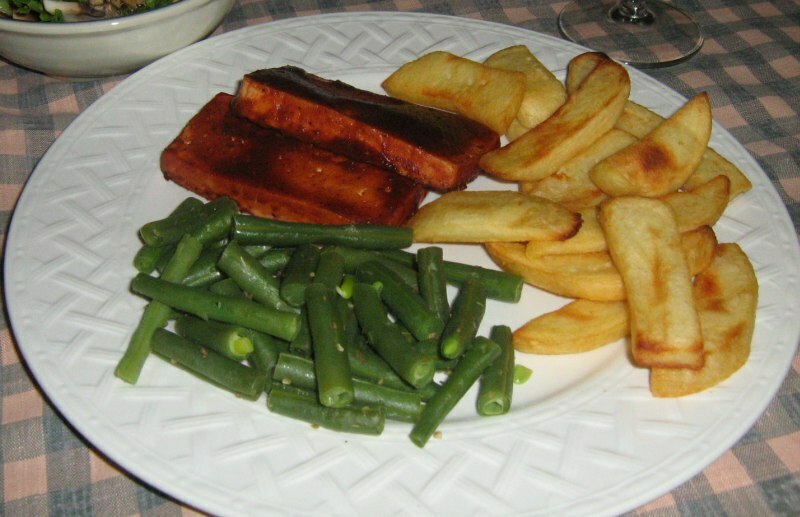 Barbecue style baked tofu is a delicious way to use tofu in a variety of recipes. In this case the tofu is not cut into small strips. This recipe calls for marinating the tofu and then baking it. This also makes a great sandwich or a terrific ingredient for a stir fry. Baking will also cause the tofu to take on an added appeal in terms of texture. For this recipe you can, again, choose to use about 1/2 cup of your favorite BBQ sauce or the one indicated in the recipe below. Either way, if you like BBQ you're sure to like this. Prepare barbecue sauce: Combine ketchup, apple juice concentrate, vinegar, soy sauce, onion and garlic powder, black pepper, and cayenne pepper in a small measuring cup or mixing bowl. Remove tofu from the press and pat dry. Carefully arrange in a sandwich-sized zip-top bag, then add marinade. Seal the bag then carefully massage it so that all the tofu slices are coated with marinade. Refrigerate 4 hours or more (overnight is ideal), turning the bag occasionally to keep all the slices coated. Preheat oven to 375°F. Remove tofu from bag and place it in a glass baking dish. Drizzle with any remaining sauce and bake, uncovered, until dry and deep golden brown, about 35 minutes. Recipe from Healthy Eating for Life for Children by Amy Lanou, Ph.D.; recipe by Jennifer Raymond, M.S., R.D.